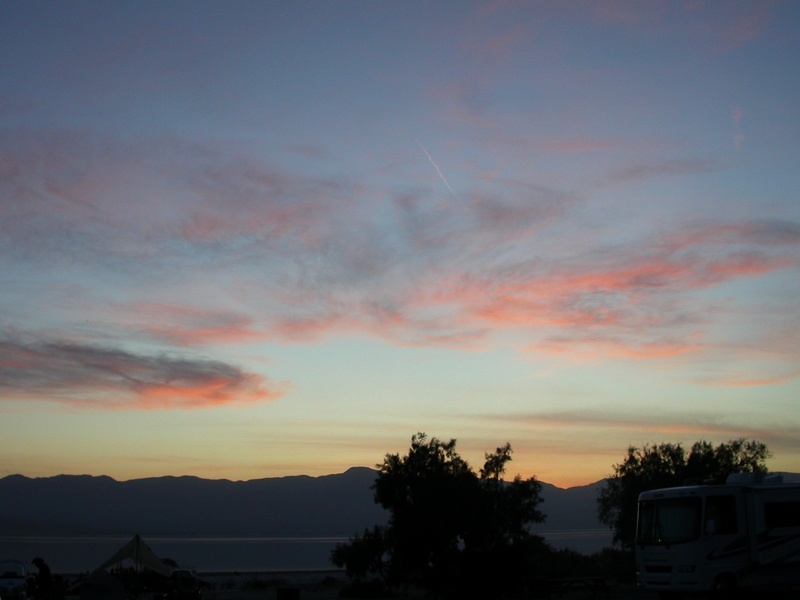 Last Saturday, March 12, London and I went camping at the Salton Sea. It was the first time we’d been camping since the All-Arizona Star Party back in November, and my first serious observing since then, too. The forecast was for partly cloudy conditions, and I didn’t want to lug out a big scope if the weather was iffy. Part of this was laziness, and part practicality: we were car camping, and with the back seats folded down and the two of us stretched out to sleep, there would be no place in the vehicle to put a big scope if there was any precipitation. 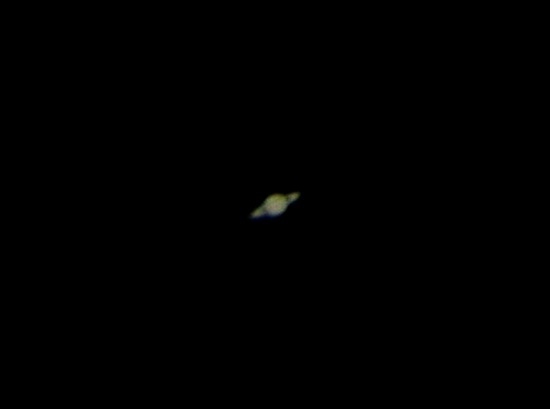 I took Shorty Long and Stubby Fats, my SkyWatcher 80mm refractor and 130mm reflector, and a tripod that fits either one. 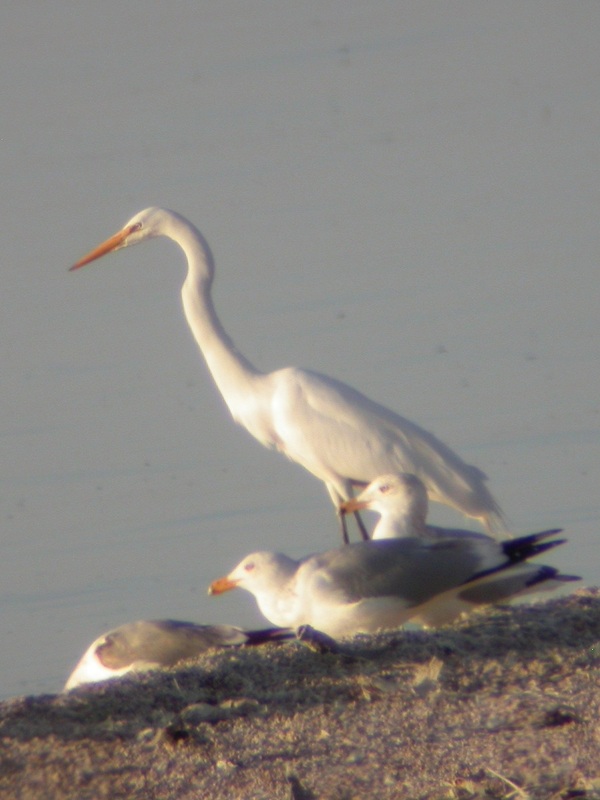 I set up Shorty right after we arrived and spent some time watching shorebirds, including the egret shown above, which I shot through the scope at a distance of 200 yards or so. As I am wont to do, I visited the nearby campsites and told people they were welcome to come over and have a look. I got a few takers. There was a big family get-together a few spots down, and about 20 people spanning three generations came over for a look at the moon, and at Saturn later on. I also hailed a couple that I saw strolling through the campground right after dark. Their names were Al and Mavis and we ended chatting for a good long time. I even toasted them some marshmallows. I learned that they work as volunteers in the Salton Sea State Park visitor center, and they invited us to stop in the next morning. We had visitors on and off until almost 10:00, when I pulled a couple of camp chairs together, grabbed a blanket, and had London climb up in my lap. We looked up and watched for shooting stars until he feel asleep. We saw one together, and I saw several more after he sacked out. It was bittersweet–London is six years old now, and I think the last time he fell asleep in my lap was about a year ago. I always wonder if each time will be the last. Don’t get me wrong, I’m thrilled to see my little boy grow into a boy, full stop, and we have so much fun doing things that were impossible for him even a year ago. But I miss my baby, too. The sky was not bittersweet, it was just plain sweet. A few clouds hovered around the horizon but none came overhead, and I found and got good looks at everything I tried for. The moon was at first quarter, which makes it bright and pretty but not so bright that one can’t do a little deep sky observing on the side. 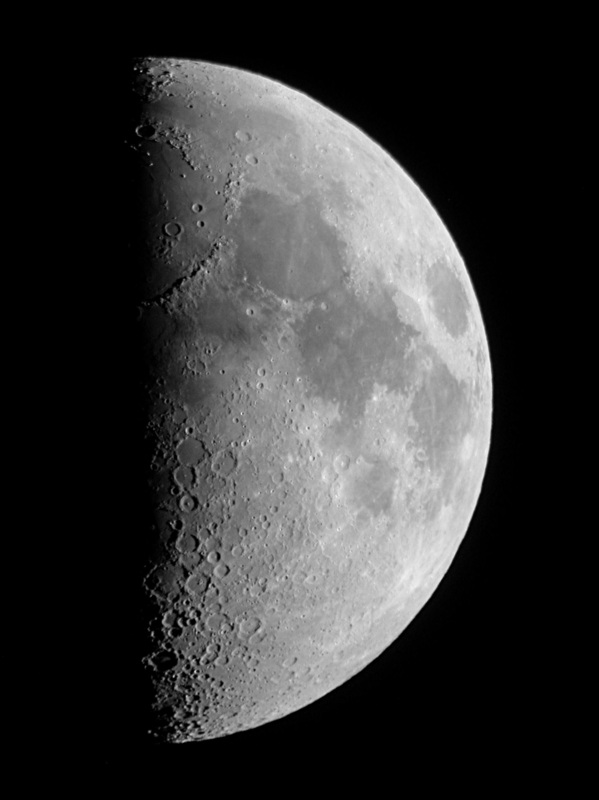 I took the above photo through Stubby Fats, the 5″ reflector. With its fairly steep f/5 light cone and central obstruction, Stubby does not deliver the same contrast the unobstructed refractor, but I didn’t get any complaints. In the early evening, with the moon dead overhead, I had to use Stubby because the long tube of the refractor put the eyepiece uncomfortably close to the ground. Later on I switched to Shorty Long for Saturn and some of the brighter clusters and nebulae, and then back to Stubby for my serious deep sky run after the moon set. Saturn was a real treat. By a little after 8:00 it was high enough in the east to look good, although I could tell that the seeing (atmospheric turbulence) was degrading things a bit. Once it climbed out of the near-horizon roil, it was simply stunning. The rings are nicely open now and the above photo, taken through Shorty, does not do it justice. At the eyepiece, the shadow of the rings was a black line etched across the planet’s disk, like mascara. I could make out some detail in the clouds, too, subtle pastel shadings wrapped horizontally across this fast-spinning world (a day on Saturn is 10.5 hours long, and the planet’s rotation has squashed it into an oblate sphere only 9/10 as tall as wide). I spent a good long time just plinking around, getting reacquainted with the sky. The Great Nebula in Orion (M42) looked fantastic, as did the Pleiades (M45) and the Beehive Cluster (M44). The Double Cluster in Perseus was visible, but it suffered from the abundant moonlight–this double handful of diamonds looks best against the black velvet of a new-moon night. 1:30 AM. Antennae–1st quarter moon not quite set, 108x in 130N, dim blobs between two faint field stars, more tantalizing than inspiring, but visible even at 20x with averted vision. As often happens, I was struck by the fact that all these things, unimaginably big or small or hot or cold as they may be, really are out there…they confront us with the regality of the materially real. I will definitely have to revisit these with a bigger scope on a darker night, and see how far I can trace the tails of stars thrown off by their gravitational dance. By this time the summer constellations were rising, and I hit M13, the Great Glob, in Hercules. It was beautiful, as always, but as usual I hopped next to M5 for a comparison and found M5 just a bit more pleasing to the eye. In comparison, M13 is bigger but more diffuse, and in my opinion less pleasingly structured. It’s a big ole ball of stars, but in a bit of a formless lump, like grits ladled out onto a cafeteria tray. M5 is smaller and more compact, but with a brighter, more concentrated core, and a periphery of stars that appear to be in concentric rings, like shock waves from an explosion. M13 looks inert and M5 looks somehow kinetic (I’m editorializing here, and your preferences may differ–go compare them back to back and let me know what you think). Then it was time for more galaxies. I picked up the Leo Triplet–M65, M66, and NGC 3028. These three spiral galaxies are close together as seen from Earth and also in fact. They represent a small gravitationally-bound group much like our own Local Group, which includes the “grand design” spirals of the Milky Way, the Andromeda Galaxy (M31), and the Triangulum Galaxy (M33), plus 30 or more dwarf galaxies that hover about like courtiers around medieval royalty. The Leo Triplet must include its own host of dwarf galaxies, but if so they remain unseen by me. However, with a low-power eyepiece I could see all three of the great Leo spirals in one field of view, the combined light of perhaps one and a half trillion suns. There is another triplet of big, bright galaxies in Leo, the M96 Group, which consists of the twin spirals M95 and M96 and the elliptical galaxy M105, plus a train of lesser NGCs. The Leo Triplet might actually be satellite members of the M96 Group, and both are relatively close by within the Virgo Supercluster, to which our own Local Group also belongs. These galaxies are fellow citizens of the cosmos with our own Milky Way, comparable in size and age and likely history, and by observing them we get a little perspective on our place in the universe–both scientifically and philosophically. The 20x eyepiece swept up the three Messier galaxies of the M96 Group into a single field as well. I frequently had to step away from the telescope, not to rest my eyes but to collect the scattered fragments of my mind, simultaneously humbled by the immensities before me and empowered by the homegrown primate ingenuity that put them, however briefly and imperfectly, within my grasp. I felt blessed. The Spindle Galaxy, NCG 3115, was, as the name implies, a bright elongated needle of starlight, like a miniature Sombrero. Also living up to its name was NGC 3242, the Ghost of Jupiter. Like the Ring and the Dumbbell, the Ghost of Jupiter is a planetary nebula, a shell of gas blown off by a dying star. In The Urban Astronomer’s Guide , “Uncle” Rod Mollise wrote that contemplating the remains of dying stars gave him the chills. I had previously dismissed that as poetic license, but at 2:30 in the morning, all alone in the cold and dark, I could suddenly relate. I turned south, to warmer climes and cheerier sights. Directly to the south the crooked, asymmetric star patterns of the constellation Centaurus reared above the horizon like the rigging of a wrecked ship. Huddling among the wreckage I found Omega Centauri, NGC 5139, the largest globular cluster in the Milky Way. OCen is a beast, 86 light years in diameter and containing several million stars (most globs have a few hundred thousand to perhaps one million). My notes say simply, “DAMN that’s a big glob”. When I looked away from the eyepiece–globstruck, as it were–I saw that to my surprise Omega Centauri was easily visible to the naked eye. 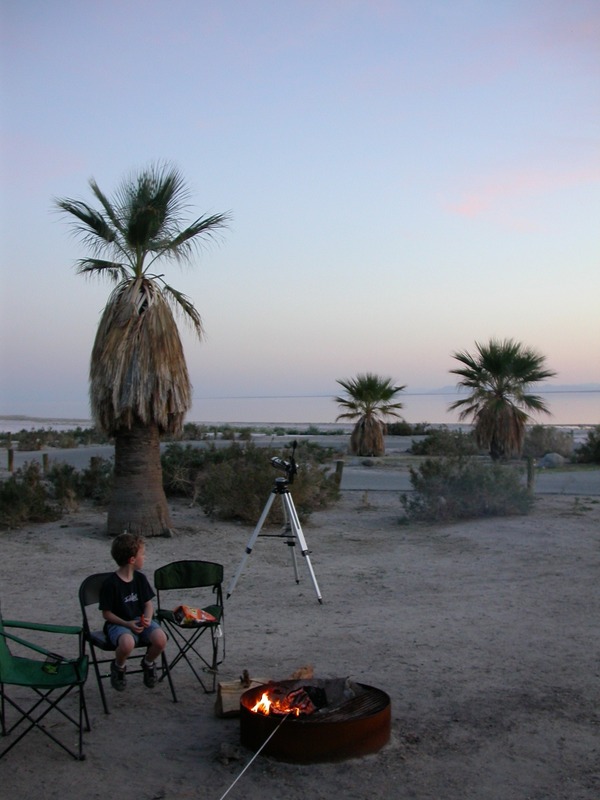 I had heard of other observers catching it with bare peepers from SoCal, but on my only other viewing from the Salton Sea it had been entangled in some near-horizon murk and invisible to all but the telescope. I had seen it with my naked eyes on the beach in Uruguay last summer, where it loomed directly overhead like a deity, too vast to be encompassed by mortal faculties. It was oddly comforting to see it down near the horizon, where, according my parochial mental calculus, it “belongs”. I was winding down. I briefly visited the globs M4 and M80 in Scorpio, the Double Double star in Lyra, and the Ring Nebula, more to check in on these old summertime friends than to have my mind blown yet again, although they were all quite beautiful. My penultimate target was the Sombrero Galaxy, which showed its dark dust lane and trademark shape much more clearly now that the moon had set. I ended on Saturn, the jewel of jewels. It rises just after dark these days, and will be visible in the evening sky for the rest of the spring and much of the summer. Good times are coming. In the morning London and I made pancakes, took our regular hike along the shoreline, and then drove to the visitor center. 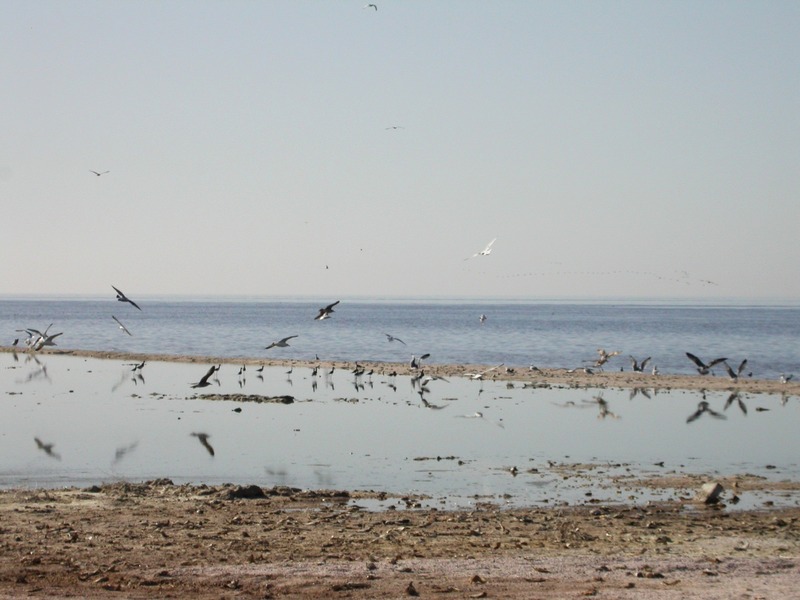 In half a dozen trips to the Salton Sea, I had never been. Al and Mavis welcomed us and showed us around, and asked if we were interested in going on the noon kayak tour. The kayaking tours are free, you just have to sign up in advance. We hadn’t, but there were a couple of cancellations, so from noon to 1:30 we kayaked along the shoreline, enjoying the wheeling flocks of birds and the cool sea breezes. And now I am sitting in the middle of civilization under a deck of clouds that is supposed to hang around all week. I am already itching to get back out. Surely rotation has stretched it? It’s boring old gravity that’s done the north-south squashing. This has been a Self-Appointed Pedantry Police announcement. No need to thank me, just doing my job. Beautiful description showing your enthusiasm for our passion of viewing the night sky objects. Also, excellent comments on facts about what we view. Much Appreciated post.